Posted October 2, 2014 by Lucia Osborne-Crowley & filed under City News, Featured City News. Historic terraces on Scott Street in Pyrmont are under threat after being placed on the Sydney Harbour Foreshore Authority’s divestment list this month. The terraces are among the last remaining single-storey Georgian cottages left in Sydney and have significant historic value to the Pyrmont community. 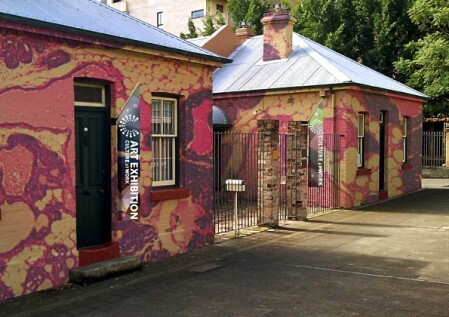 The properties are currently occupied by Culture At Work, a not-for-profit organisation that facilitates engagement with the arts in the Pyrmont community. The artist-led initiative connects artists with scientists to provide residencies for local artists and workshops and activities for the community. Culture At Work founder and CEO Sheryl Ryan was recently informed the terraces had been placed on the Sydney Harbour Foreshore Authority (SHFA) divestment list, meaning their future was uncertain. “We are not really sure what is going on. Our lease expires in July of 2015; when we tried to obtain a new lease, we were told we could not,” Ms Ryan said. Ms Ryan has not been given any further information about the future of Culture At Work or the Scott Street terraces. She believes the decision to divest the terraces is part of the NSW Government’s broader plan to develop the Western Harbour Super Precinct, particularly Barangaroo and Pyrmont. Jean Stuart, president of the Pyrmont Community Group, said it is vital that Culture At Work are able to remain in the Scott Street terraces in order to provide a much-needed service to the local Pyrmont community. “Culture At Work has proved to be very successful,” she said. Ms Stuart said it was vital that SHFA recognise the significance of both the terraces and the organisation to the Pyrmont community. The terraces have been threatened by the harbour authority once before, when it was known as City West Development Corporation. In the early 1990s, City West planned to demolish the terraces when it took over authority of the harbour foreshore. Ms Stuart was among those community members who campaigned for their preservation in this instance also. “The community fought for the preservation of the terraces when they were going to be demolished,” she said. The space has been dedicated to providing a creative space for the Pyrmont community ever since. The Sydney Harbour Foreshore Authority did not respond to questions about the future of Culture At Work or of the Scott Street terraces. A spokesperson for Minister for Plannig Pru Goward also did not respond to specific questions regarding the terraces, but said the management of the harbour foreshore is under review.